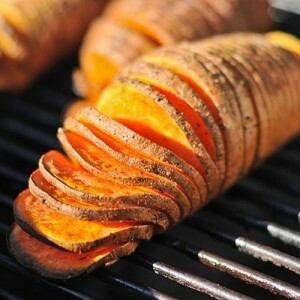 Sweet potatoes are very often overlooked, however they shouldn’t be, a sweet potato can be a substitute for normal potatoes, or paired for an extra level of taste to a normal dish, boiled or roasted they are full of flavour and good for you, for best results in any dish, wash well and leave the skins on, here we have a fantastic grill recipe for the perfect sweet potato roasties! Preheat the grill to medium high, preparing for indirect cooking. Cut off a small slice on the bottom of the potatoes so that they sit flat on the counter. Rest the potato between a couple of disposable chopsticks and slice the potatoes with a sharp knife every 1/8th of an inch. The chopsticks act as a stop so that you don’t slice all the way through your potato, and I suggest again, disposable ones so that you don’t ruin your favourite pair. Rinse the potatoes well under cold water, even in between the slices. Microwave the potatoes for 4 minutes, then carefully flip them over and microwave again for another 4 minutes. Carefully remove the potatoes from the microwave and brush with olive oil, season with salt to taste. In a microwave safe bowl, melt the butter and add the Grand Marnier, stirring to combine. Place the potatoes on the cool side of the grill and grill bake for 30 minutes, basting frequently with the Grand Marnier butter. When they’re done you want the middles to be soft and the edges to be crunchy. Carefully remove them from the grill and serve warm. This entry was posted on Tuesday, July 31st, 2012 at 6:57 am	and is filed under Barbecue Recipes. You can follow any responses to this entry through the RSS 2.0 feed. You can leave a response, or trackback from your own site.